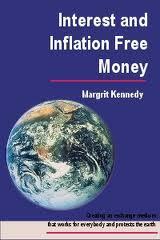 No Anglo-American economist has come close to countering the scam of usury -- losery -- as has Dr. Margit Kennedy. Her empirical findings simply wipe the field of all opposition. In Germany the poorest 80% pay 1 billion Euros in interest to the richest 10% PER DAY. Some good documents by Margrit Kennedy "Why Do We Need Monetary Innovation?" Margrit writes about "Complementary Currencies." An excerpt from Margrit Kennedy's 1995 book titled: "Interest and Inflation Free Money."